What a day to be out of town! Some time ago on Twitter, I saw that @HuffPostBooks was trying to get more followers to reach 55,555. I tweeted a reply from my @auswomenwriters account saying I’d follow – if they’d consider posting more pieces on books by Australian women. The next thing I knew, I had a Twitter invitation from the HuffPo Books blog editor to write something for their blog about Australian women writers. I immediately deflected attention to both Sophie Cunningham and Kirsten Tranter, saying either of them might be interested. When neither of those authors responded to the tweet, I took a deep breath. Maybe I could write something? After consulting the AWW team of book bloggers and exchanging emails with the editor over the angle I should take, I chose the obvious one: the news that the inaugural Stella Prize would be awarded next April. I decided to link the news with a survey of books published this year which have been reviewed for the AWW challenge, since these books – in theory – should be eligible for the prize. They cover a wide variety of genres that don’t normally get reviewed in literary pages, and include titles which, because of either their setting or subject matter, wouldn’t be eligible for the Miles Franklin. I wrote the piece and sent it off. Then yesterday morning I received word that my piece had been posted. I took a look, and the first thing I noticed was a formatting error. (Most book titles were italicised; some weren’t.) Isn’t that always the way? I had to remind myself that I’d asked another book blogger to look over a draft copy of the article and she didn’t notice. How important are italics anyway? I tweeted the link to everyone I could think of and posted it on Facebook, then felt a wave of nerves as I waited for the response. Is what I’ve written crap? It’s just a survey. There’s no substance. Bla, bla, bla. The committee of critics in my head started chattering. 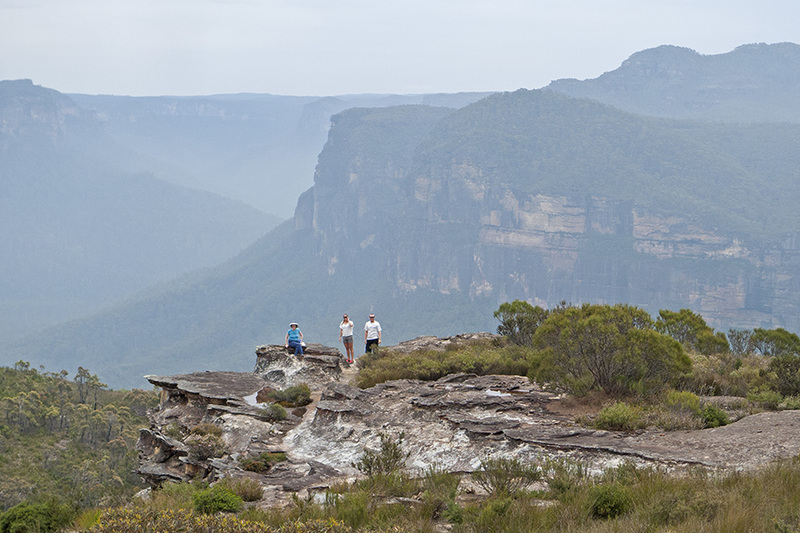 Maybe fortuitously, I was up in Katoomba, getting ready to go bush walking with guests from the UK. We piled in the car and travelled the 18 km dirt road out to the ancient Grose Valley escarpment at Mount Hay. A sea haze had drifted in from the coast over the Cumberland Plains, obscuring the sun and sharpening the definition of the hills in a way I’d never seen at this time of year. Many tiny wildflowers were in bloom, as well as Flannel Flowers, my bush favourites. For a few hours, I forgot about books and writing. When I got back to town last night and a proper internet connection, however, the first thing I did was to run through email, Twitter and Facebook. There were dozens of comments in response to the HuffPo piece – too many to reply to personally – and lots of notifications that people had retweeted the link. It didn’t really matter what I’d written. The important thing was that Huffington Post Books blog had given a great big shout to the Australian Women Writers Challenge and The Stella Prize, as well as to dozens of books published this year by a host of talented Australian women. That’s it! I’m now a HuffPo book blogger. You can read yesterday’s Huffington Post piece – “Want a book by an Aussie woman in Australia? Try looking for a kangaroo on the spine” – here. Italics are not important… it was a terrific piece. Bravo Elizabeth! Ha! Thanks, Sulari. Amazing what we obsess over. Great to see that australian literature gets some visibility outside australia!! Isn’t it? I hope it helps to raise the profile of the writers and the Stella Prize – and, of course, next year’s AWW challenge. Thanks, Kelly. It is cool! Thanks, Michael. And thanks for signing up to combine next year’s AWW challenge with your Literary Exploration challenge. It’ll be great to see reviews of such diverse genres. Well done and it was so right for you to respond; you are more than qualified to give the overview and do what you are already so good at doing, shining a light on fabulous Australian women writers. Congratulations on being proactive and taking up the challenge holding the torch for all those writers. Thanks, Claire. It did occur to me later to think, if I didn’t have something to say after all this year’s reading, there would be something wrong! Oops, there go the italics again! Elizabeth, this feels so right – you were so meant to write this. Great effort and a great article. I reckon we all feel just a little bit proud. That’s such a lovely thing to say, Shirley. Thank you. It’s a joy to be part of this reading and reviewing community. Thank you. It’s a pleasure to showcase so many talented Aussie writers. Congratulations! What a fantastic opportunity, Elizabeth. Elizabeth, I was so proud of you when I read your article. That’s really taking the AWW to an international platform.